All accommodation at the Nissi Beach Resort includes a balcony or a terrace with views over the clear waters of the Nissi Bay lagoon. Every room has an en suite bathroom and satellite TV. The Nissi Resort offers 3 restaurants with different characters and cuisines, and 5 beach kiosks for light snacks and drinks throughout the day. Several wooden gazebos and outdoor terraces are available for you to enjoy the sea breeze. Certified Cypriot breakfast is served in the morning. Children will enjoy their stay, thanks to the shallow children’s pool, 2 playgrounds and the supervised kids club. A full range of water sports is available on the beach. 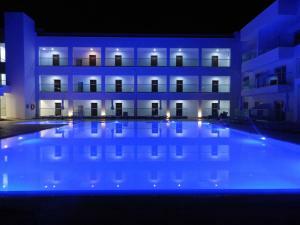 The resort is located 2 km from the centre of Ayia Napa. Larnaka Airport is about 35 minutes’ drive away. When would you like to stay at Nissi Beach Resort ? Elegant room with views of the lush garden. Includes minibar, air conditioning and satellite TV. Offer views of Nissi Bay. Comprises of split-level bedroom and lounge areas. Offer Nissi Bay views. Each day we'll check prices and send you an email for your selected dates at Nissi Beach Resort. If you don't have specific dates but would like to check prices for say next weekend or say next month we can check the price too. Click to write a review and share your experience of Nissi Beach Resort with other travellers.